Shubman Gill's maiden double hundred put Punjab in a strong position vs Tamil Nadu (BCCI Photo) HIGHLIGHTS Shubman Gill hit 268 to put Punjab in a commanding position vs Tamil Nadu Hardik Pandya struck 73 off 137 balls for Baroda vs Mumbai Rajasthan beat Odisha by 35 runs in their Elite Group C game Shubman Gill struck a brilliant maiden double century in the Ranji Trophy to put Punjab in the driver's seat against Tamil Nadu in Mohali on Sunday. Gill hit 268 off 328 deliveries, studded with 29 fours and four sixes, to help Punjab score 479 in response to Tamil Nadu's first innings total of 215. 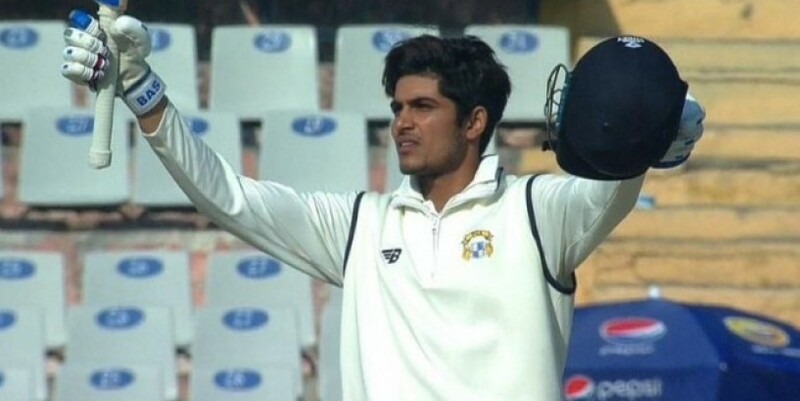 A late strike by Sandeep Sharma gave Punjab the advantage Sunday against Tamil Nadu at the end of day three of their Elite Group 'B' match. Faced with a massive deficit of 264 runs, Abhinav Mukund was dismissed by Sandeep Sharma for 74 (141 balls, 9 fours) towards close of play to leave Tamil Nadu at 166 for 3. The home side appeared on track for a huge total as Gill, resuming on his overnight score of 199, continued to bat with ease. Though he lost skipper Mandeep Singh (50) early in the day, he found an able ally in the experienced Yuvraj Singh (41, 34 balls, 8X4) and added 61 runs at a fast clip. Yuvraj, however, was unlucky as he was run out backing up too far when Gill's straight drive was deflected off K Vignesh's hand on to the stumps to leave him stranded. Later, Gill was involved in another useful partnership of 83 runs with Gurkeerat Mann (48). Lanky left-arm spinner R Sai Kishore's six-wicket haul was largely responsible in restricting Punjab as he triggered a collapse after lunch. From 462 for 5, the home team slid to 479 all out in 118.5 overs with Kishore taking the wickets of Mann and Gill, stumped by Dinesh Karthik when he stepped out for a big shot. Tamil Nadu began the second innings in a solid manner with Mukund and N Jagadeesan batting positively, especially the latter looking for runs. Jagadeesan hit six fours and a six before Yuvraj had him caught by wicketkeeper Abhishek Gupta for 50. Yuvraj struck again with his slow left-arm spin as he had Baba Aparajith leg-before wicket off the very next ball. TN captain Baba Indrajith, however, kept out the hat-trick ball. He and Mukund played in an assured manner and also scored whenever presented with an opportunity. With the pacemen unable to get help like the way they did on the first day, Punjab skipper Mandeep was forced to rely on the spinners (part timers Yuvraj, Gurkeerat and Abhishek Sharma), who could not make much of an impact. Mukund brought his fifty with a shot off Abhishek Sharma and continued to push on. He was dismissed against the run of play, caught by Jiwanjot Singh off Sandeep Sharma. Indrajith (37 batting, 66 balls, 4X4) and night watchman Sai Kishore (0 batting) ensured there were no further alarms for Tamil Nadu, which still trail by 98 runs. A hard-hitting half century from fit-again Hardik Pandya went in vain as Mumbai grabbed a narrow 29-run first innings lead after tea on day three of their Ranji Trophy Elite Group A game on Sunday. Pandya, who had taken five wickets in the Mumbai innings, ran out of partners before being last out for an attacking 73 off 137 balls with 9 fours and one six after he bravely tried to guide the visitors past the hosts' first innings tally of 465. Pandya, who came to the crease when Baroda were 307 for three, departed caught behind to end the visitors' innings at 436. He had escaped earlier when he was bowled off a no-ball. In the remaining time Mumbai were rocked by Pandya's two-wicket burst and were tottering at 20 for 2 at close, an overall lead of 49. Rajasthan pacers yet again produced a stellar performance as the visitors defeated Odisha by 35 runs in their Elite Group C game in Bhubaneswar. Rajasthan bundled out Odisha for 137 in their second essay with pacer Aniket Choudhary (5-25) taking his second five wicket haul of the match to help the visitors script a memorable win in a low-scoring clash. The momentum swung back and forth throughout the game but Rajasthan held their nerves in the end to emerge triumphant.